Sign Age is proud to be part of Brisbane’s history of painting, decorating and signwriting. Neil Cox is the grandson of George Cox, who was one of Brisbane’s and Queensland’s most influential painters and decorators. George Cox was the proprietor of George Cox and Sons from early 1900’s. George received an OBE for his commitment to painting and decorating. George Cox and Sons Painters played a significant role in the 2nd World War effort, painting camouflages for the Australian and allied defence forces. George was the patriarch of this great painting empire until his death in 1980. Albert Cox, was the son of George Cox and worked with his father for his whole working life. Albert , a very experienced painter and signwriter, was technically superb, and it should be noted that as a left hander, signwriting and painting should have been a challenge. Neil was proud to join his father and grandfather in the family business. Neil wanted nothing than to be a signwriter from the time he could hold a brush. As a child his greatest hobby was to paint cartoon characters in reverse on glass – he did thousands. Neil’s desire to continue this painting and signwriting legacy was evident at the age of 11 when he built his first illuminated sign, which sat above the shed in the backyard. Neil is a qualified signwriter and spraypainter. Neil continued on with the George Cox and Son’s legacy after his father’s retirement and his grandfather’s death. He also started his own signwriting business – Neil Cox & Co. in 1975. Neil and his wife Denise ran both these businesses simultaneously for over a decade, until George Cox and Sons was finally wound down. 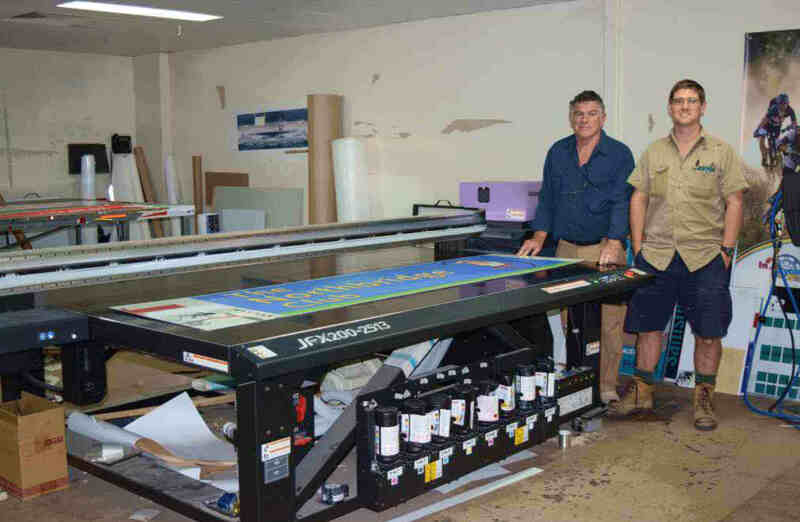 Neil Cox & Co, continued to flourish, and became one of the largest and busiest signwriters in Brisbane. Neil has also had a continual commitment to the trade that he loves, and has always trained apprentices, and if you speak too many of the tradesmen in the sign industry they will probably have worked with or been an apprentice of Neil Cox & Co at some stage. Neil is noted for his superb ability as a tradesman and his ability to think outside of the box. Neil has worked for many of this country’s largest companies, including National Australia Bank, Super Cheap Auto, Blockbuster Video, Crazy Clarks, Video Flicks, Freedom and Wow Sight and Sound. Neil sold his business Neil Cox & Co in 2004, for personal reasons. Neil’s passion for the industry is unwavering, and he now joins his son-in-law Tony Fleet in Sign Age. Tony has completed a Bachelor of Physical Education (Otago University), and has now completed his Signwriting Trade. Tony adds a new contemporary dimension to this family business. This father in law and son in law team showcase the new generation of Cox’s and now Fleets to add depth and experience to the sign industry. Tony has hopes that one day his sons will take over the reins of this dynasty, so that over a century worth of knowledge will continue to be available to the Brisbane public. As well as Tony, Sign Age Queensland is still very much a family affair with Denise and Claire providing pivotal roles in administration, accounting and web content management. Claire’s years of involvement in the trade have ensured that she is able to provide high quality content on the website with information that is invaluable to both new and current clients.